As most of you will know, I'm from New Zealand - my blog name kind of gives it away :P. New Zealand is great. We have beautiful countryside, heaps of cute small towns and most important to this post - a low crime rate. Which means our newspapers are often beefed up with "fluff pieces" - things that aren't massive tragedies but are of some interest to the public. One of the biggest fluff pieces this year, was Marmageddon. We ran out of Marmite!! In February 2011 there was a massive earthquake in Christchurch that killed almost 200 people. I remember watching it on the news in disbelief... that sort of stuff just doesn't happen around here! I found it hard enough to comprehend that 185 people weren't going home that day, so when the Earthquake and Tsunami happened in Japan a short time later and killed tens of thousands of people... woah, just woah. 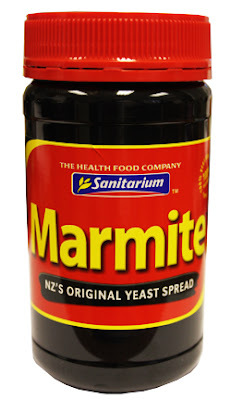 Anyway, the Marmite-making factory in New Zealand is in Christchurch, and after a few months it was deemed unsafe for production - not earthquake-proof and so on. Seriously, I don't think that ground is ever going to stop shaking, they're still constantly having little ones and it's been almost two years! I would've gotten out of there if it was me, but kudos to those who stayed. If you've done today's Take Two Challenge, add it here! So since March or so, we haven't had Marmite on the shelves. And since April or May, I haven't had Marmite This is no small matter, I was practically raised on the stuff. Hot toast with Marmite and margarine - my favourite! I've had to downgrade (YES! DOWNGRADE!) to Vegemite, oh woe is my life. So today's New Zealand inspired nails are little bottles of Marmite. I wish I could have made the letters more regular but OMG do you know how small they were?! 3-5mm! Tiniest writing I've ever done on my nails. I started doing my right hand but no, my skills do not extend that far - it would have just been a mess. So I left them like this. Hope you like my New Zealand inspired nails and I can't wait to see what everyone else has done! In case you missed it - the place where you can link up has been moved to before the jump-break. This way you can add yourself from my main page instead of scrolling to the bottom of each entry. Thanks! I used to hate Vegemite, but I'm adjusting... but I am extremely loyal to Marmite. The shortage has been torture! aMAZing!!! LOVE THEM!!!! I really miss Marmite. These are very cute. I've been marmiteless for a few months now after giving my last jar to my cousin who, being pregnant and having two young kids, was in greater need than I.
Aw that's nice of you :) I have a workmate who still has heaps and I'm so jealous! ^I actually went to facebook and was half-way through a message to you when I realised it's a bit sad to beg to buy used marmite... Sigh. Yeah, peanut butter is a-mazing. But don't worry, marmite is above promite! Vegemite is... okay. I've never tried promite! I have quite the story about Vegemite... I actually lived a year in Australia. The first morning, I was in a hostel, and I woke up to the "breakfast" that was included in my rent... Basically toast with a bunch of spreads. There was everything you could have wished for. Peanut butter, jam, honey, butter... and then, this one unmarked dark brown spread. "Huzzah!" I exlaimed, convinced I was dealing with Nutella... I spread the stuff on so thick there was almost twice as much spread as there was bread. Well, you guessed it. That was NOT Nutella. It was vegemite. It tasted like I had just shoved about a dozen concentrated beef broth cubes in my mouth at once. And you know what? Despite this traumatic beginning, I would eventually develop a very fulfilling relationship with vegemite. I grew to tolerate it, and then to like it, and then to just not be able to live without it. I remember at one point I caught myself opening the jar just to dip my pinky in there and have a taste on the go. If that isn't true love, I don't know what is. Hahaha I can just imagine your face when you had a bite of it! I've heard of a few horror stories similar to that, that must have been painful. I had mine very thin! Means it last forever too, which is great. I'm glad you like Vegemite now! Marmite IS similar... but better. I don't know, to be honest it's been that long I can barely remember what it tastes like. These are very cool. The detail is awesome! So, coming from a US girl, what is Marmite? Thanks! Marmite's a yeast-based spread. It's got quite a distinct taste... it's quite a love it or hate it thing.